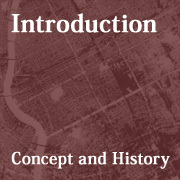 In the early hours before dawn on 10 March, 1945, some three hundred American B-29 bombers took part in a carpet bombing raid on the Shitamachi (downtown) district of Tokyo. This highly populated area was quickly rendered a fiery hell that made refugees of one million persons and claimed the lives of an estimated one hundred thousand others. The raid was one of over a hundred such raids that eventually laid waste to sixty percent of the city's total area. 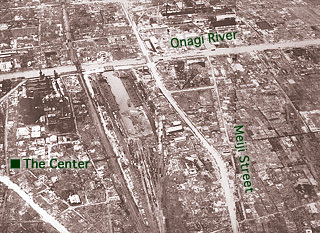 September 1945 photograph taken by the United States military showing extent of damage to the area around the present day Center of the Tokyo Raid and War Damages. 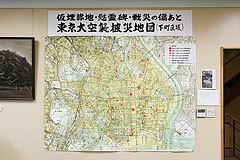 The Association to Record the Tokyo Air Raid has actively collected artifacts and documents detailing the extent of these air raids and war damages since 1970. In 1999, public plans for a Memorial Hall of Peace were frozen, and, in league with the Institute of Politics and Economy, the association saw no other choice but to seek private donations in an effort to build a proper edifice. 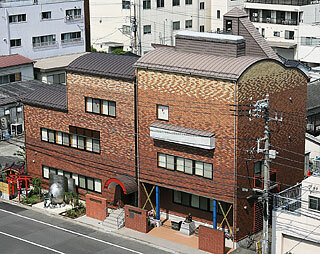 With the cooperation of over four thousand donors, the present building was finally completed on 9 March, 2002. The land for the building, which is located in one of the areas most damaged by the raids, was donated by a single generous supporter. 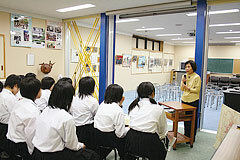 In March 2007, further contributions from our kind patrons allowed additional space to be added to the building. As a result, we have been able to both expand our exhibits and create lecture space for groups of students touring Tokyo. This has enabled us to realize our objective of making the center a place of learning for young people. We look forward to producing special exhibits in the future as well as to the center long serving as a focal point for further research and investigations into the topic of war damages. We sincerely desire that it serve as a place where young and old alike can learn the importance of life and foster a willing spirit to share that knowledge with others. With a firm determination to never allow the repetition of such tragic events and a refusal to allow the suffering of civilians to have been in vain, it is the center's earnest desire to pass knowledge on to future generations and stimulate the interaction of peace-loving individuals. 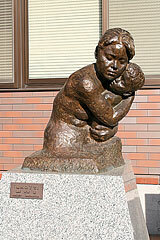 "In Time of War"-- Statue of mother and child by Shin Kohno. 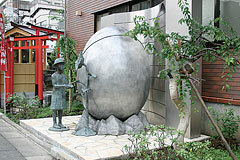 "Children's World Peace Statue (Tokyo)"-- Plans for this statue and diligent fundraising were conducted by Tokyo junior and senior high school students while studying about the effects of the conventional and atomic air raids. This room on the second floor is used for viewing video material and holding seminars with survivor speakers for reserved groups. The walls are covered with photographs, maps, and original works of art that all illustrate the horrors of the air raid. A map produced by the cente to show damaged areas. 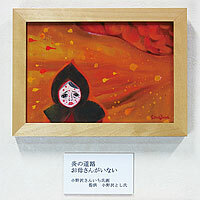 "Blazing Road" by San-ichi Onozawa. 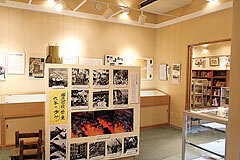 A collection of incendiary bombs, victims' belongings, survivors' documents and photographs, and other war-related materials is housed in this room on the third floor. 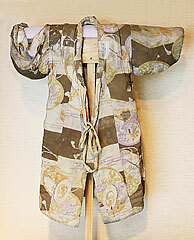 Wartime education and the student relocation program are the themes of the "Children and War" room. 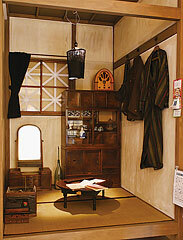 This room re-creates daily life during air raid blackouts. 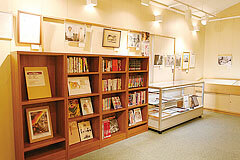 The "Thinking about War and Peace" corner highlights the writings, activities, and vision for the twenty-first century of the center's director, Katsumoto Saotome. 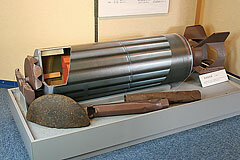 Actual size model of incendiary bomb clusters. 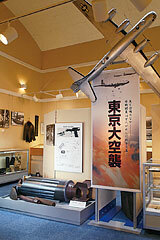 Each weapon was designed to release thirty-eight smaller bombs before reaching the ground. 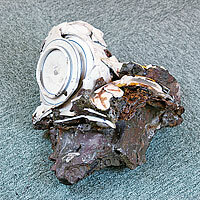 Tile and dish melted together by intense heat. 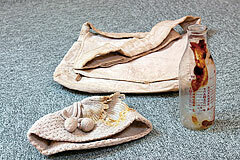 Shoulder bag, hat, and milk bottle of a child who was carried on its mother's back. 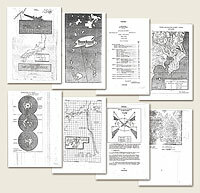 American strategic documents detailing the plans and results of the Tokyo air raid.